The spotlight at the Peugeot stand here in Frankfurt was directed on one limited edition Peugeot 508 RXH and the French automaker's HX1 concept. But alongside the copper-colored crossover and sleek MPV was the less-exclusive, non-limited version of the 508 RXH. Peugeot says all 508 RXH crossovers feature the automaker's through-the-road HYbrid4 technology, which employs a 163-horsepower 2.0-liter HDi diesel engine to drive the front wheels and a 37-hp electric motor to spin the rears. Combined, the diesel-electric hybrid drive unit delivers up to 200 horsepower and cranks out 332 pound-feet of torque. The 508 RXH is capable of electric-only operation, though Peugeot has not yet revealed the crossover's "zero-emissions" range. The automaker says the 508 RXH is quite the fuel-sipper, consuming less than 4.2 liters of diesel per 100 kilometers (56 miles per gallon U.S.) on the combined cycle. Meanwhile, the diesel hybrid emits only 109 g/km of CO2. 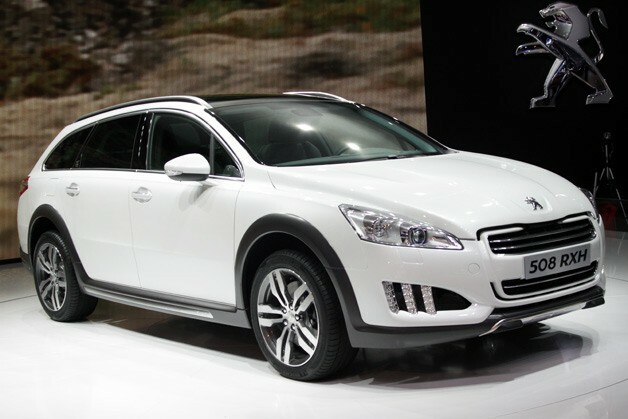 The 508 RXH will go on sale in spring of 2012 and Peugeot says its HYbrid4 technology will be added to more vehicles in the near future. Follow the jump for full details on the diesel-sipping 508 and check out live pics in our high-res gallery.